Perhaps we read a review, or browse the shelves in a library or bookstore. Maybe we scroll through the ‘recommended for you’ options from an online bookseller. Somehow or other, we choose a book. We begin reading. But this is not really the beginning at all. We readers, just like the authors of the books we choose, bring with us an accumulation of literary and other cultural ‘baggage’. Think of the book’s words and sentences as a fully functioning, but lightly clad, human form. In our baggage, we carry the means to clothe them further. 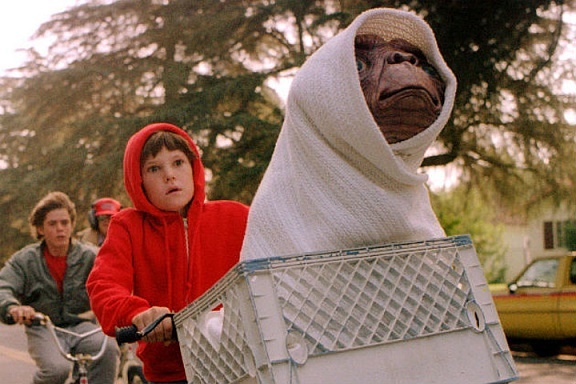 It is entirely possible to read Good Omens – and to essentially comprehend its meaning – without any specific knowledge of the 1976 film The Omen (or the 2006 re-make) and without a working knowledge of the biblical creation stories or the imagery of John of Patmos. The book makes sense even if you don’t instantly start humming along when you read the words ‘I see a little silhouetto of a man’ or ‘I should be so lucky’. You can skim right past a reference to ‘666 Fifth Avenue’ and ‘Tadfield Six double-six’ and not have alarm bells ring; you can gloss over ‘Brother Slug’ and ‘Sister Potato Weevil’ and not be reminded of the troubadour saint from Assisi. But, if you do, you’ll miss much of the humour woven through Pratchett and Gaiman’s collaboration. What to do? If you’ve received a tip-off from someone who has already read Good Omens, you will probably come to your reading of the book well prepared. 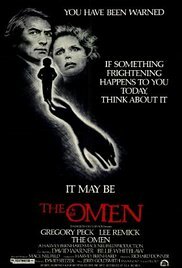 If you haven’t already seen The Omen, you will have found a basic plot outline and perhaps watched a few YouTube clips of pivotal scenes. You’ll have reached for a Bible (in hard copy or in myriad places online) and worked out what’s going on in the books of Genesis and Revelation. (Good luck with the latter – there’s many a Christian theologian who’d like to hear from you if you figure that one out.) And you’ll have tracked down Queen’s discography and familiarised yourself with their most famous lyrics. There are more occasions when Pratchett and Gaiman show their readers some mercy and offer up in-text clues. When lightning makes London’s skies ‘flicker like a malfunctioning fluorescent tube’, for instance, Crowley is put in mind of ‘A livid sky on London / And I knew the end was near. Who had written that?’, he wonders, ‘Chesterton, wasn’t it?’ Hints enough to find G. K. Chesterton’s ‘The Old Song’ if you fancy a diversion. Now we come to the part of reading where we start accessorising. By this time, the book is reasonably well dressed with the necessary undergarments and outer attire. But we might have some trinkets in our personal baggage collections that suggest meanings not necessarily envisaged by a book’s author. Take me, for instance. I was raised among hymn-singing, Methodist congregations. When I read Pratchett and Gaiman’s words ‘God moves in extremely mysterious, not to say, circuitous ways’, my mind sped straight to William Cowper’s hymn ‘God moves in a mysterious way / His wonders to perform’. Did Good Omens’ authors knowingly intend that association? Were they familiar with the hymn? I don’t know. But I know it and the association adds another flourish to my reading. My Christian upbringing also asserts itself when I read: ‘One does not … pass by on the other side.’ The compassionate Aziraphale, chiding Crowley, echoes the parable of the Good Samaritan (Luke 10:25-37, in case you’re interested). And what about this line from the horseperson personifying War: ‘Think of all the toys I can offer you … think of all the games’. Does that offer contain hints of the temptation of Jesus (Matthew 4:1-11)? Obviously, the thought occurred to me. Who’s to say whether it was in Pratchett and Gaiman’s minds or not? Foundation garments, outer layers, accessories. All dressed up and ready to go. But if you wait a moment longer, the fairy godmother might appear and make your reading even more magical. Materialising from the end of her wand could be flashy little gems like Pratchett and Gaiman’s deliberate errors (‘compost mentis’ and ‘grass materialism’) along with cross-cultural mash-ups (‘A plaque on both your houses … One of those blue ones … saying “Adam Young Lived Here,” or somethin’?’). I could go on, but why don’t you have a turn instead? 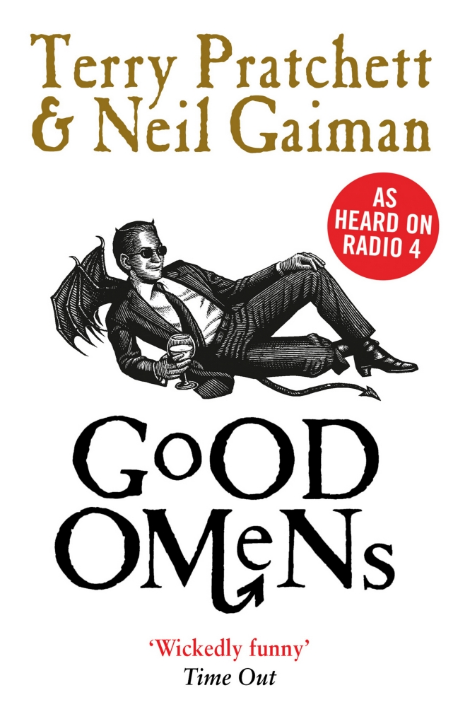 If you’ve already read Pratchett and Gaiman’s book and have a favourite piece of Good Omens ‘baggage’, feel free to add it to the comments section of this post. You can find the full text of Good Omens online via Terry Pratchett’s fan site. This free version is handy for tracking down quotes, but if you want to read the book, consider buying it or borrowing it from a library. That way the royalties go to Pratchett’s estate and to Gaiman. And there will be a few more pennies in the publisher’s coffer to help them continue publishing. If you want to discover more of the ‘hidden’ meanings in Good Omens, there’s a handy reference list on the Terry Pratchett fan site. The list includes a good number of connections that went completely over my head, including one to George Orwell’s 1984 and another to W. B. Yeats’ poem ‘The Second Coming’. John of Patmos is credited with writing Revelation, the last book of the Bible. ‘I see a little silhouetto of a man’ is from Queen’s ‘Bohemian Rhapsody’. 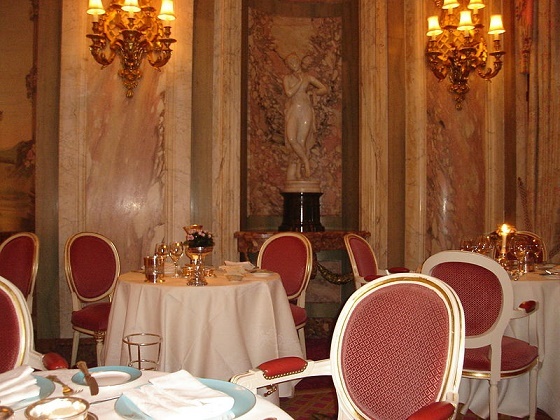 ‘I Should Be So Lucky’ is sung by Kylie Minogue. ‘666 Fifth Avenue’ and ‘Tadfield Six double-six’ – 666 is commonly referred to as ‘the Devil’s number’. You’ll find a reference to it in Revelation 13:18. ‘Brother Slug’ and ‘Sister Potato Weevil’ – Francis of Assisi names some elements of creation ‘Brother’ and ‘Sister’ in his ‘Canticle of the Creatures’. You can find the words in many places on the internet. Here’s a link to one site, the UK’s Third Order of the Society of Francis website. Blue Oyster Cult – a New York-based rock band, formed in the late 1960s. ‘A plaque on both your houses … One of those blue ones … saying “Adam Young Lived Here,” or somethin’?’ – In Shakespeare’s Romeo and Juliet (Act 3, Scene 1) Mercutio says: ‘I am hurt. 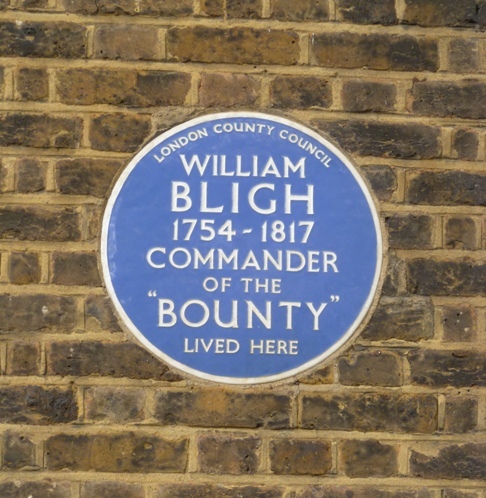 / A plague o’ both your houses!’ In London today, the Blue Plaques scheme links ‘the people of the past with the buildings of the present’ (English Heritage). Someone else has the newspaper in ‘the lounge’ today so I turn to my email for reading material and Yay! Thoughts from an idle hour. Is there free wifi in heaven? Hopefully as Dad, a huge Terry Pratchett fan (he only read Pratchett at the end of his life – I suspect I will only be reading Jane Austen) would enjoy your essay very much. I suspect Dad with his catholic (and Catholic before the lapse) background would have a grasp of many allusions. Did he read Good Omens? Probably. I need to read it now! Hi Jane, given that Good Omens was first published in 1990, I’m guessing your dad would have come across it – and both his catholic and Catholic understandings would have served him well. It’s one of those books where the more you ‘know’, the more you enjoy it. It’s certainly a great deal of fun.